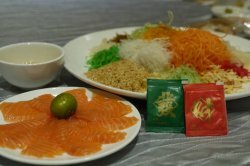 Recently, I accepted an invitation for an interview with a food blog and I was asked to name three dishes that are classic Singapore cuisine. Chilli crab just naturally came to my mind, so did the craving. So the husband and I headed to Jumbo at The Riverwalk for some crabbing business. The last time I came here was in 2011 while my last blog post on Jumbo was dated December 2010. A perfect time to revisit the restaurant again. 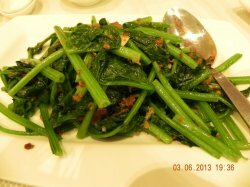 This is one of my must-order dishes whenever I’m at Jumbo. The scallops are fresh and succulent. The yam rings are crispy on the outside. smooth and soft on the inside. The sweetness of the scallops and of the yam are a perfect harmony with each other. Though this may be fried, it doesn’t taste overly greasy at all. A wonderful starter to begin the meal with. This is fried spinach tofu topped with a trio of mushrooms (enoki, shimeji & shiitake) in a oyster sauce flavoured gravy. The tofu reminds me of the same from Rabbit Brand Delicacies at Circular Road. 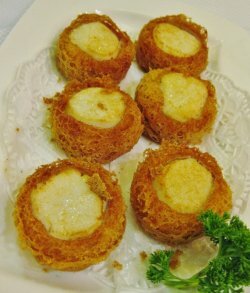 It is fried to golden brown on the outside while the middle remains wobbly and soft. 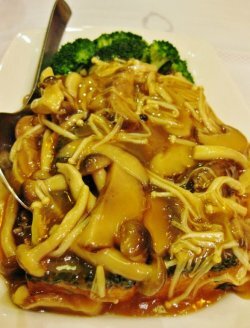 Except for the sauce which I find it a little too starchy, I love the different textures of the tofu, mushrooms and steamed broccoli. I ordered this because it is the husband’s favourite. He loves anything with salted egg, be it a dry or wet version. 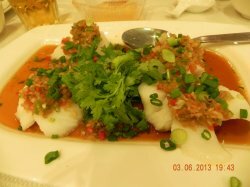 The medium-size prawns are packed with a crunch and are really fresh. 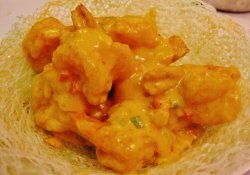 The sauce is creamy and buttery with the right amount of salted egg yolk. Overall it’s more on the sweet side and I would have loved this more if curry leaves are used to give it that extra aroma. I can never resist these fried mantous especially if we are having chilli or butter crabs. These are deep fried to a nice crisp with an even golden colour and it is moist and fluffy on the inside, perfect for soaking up flavoursome sauces. Despite the chilli crab being an iconic Singaporean national dish and that Jumbo’s chilli crab is also an award-winning one, when celebrity chef Gordon Ramsay was in Singapore last year for a cook-off with our local hawkers, his version of chilli crab actually triumphed over Jumbo’s which I wasn’t too surprised to know of. Jumbo’s chilli crabs never taste the same every time I have it. Sometimes, the sauce can be terribly starchy that I just hate it. Other times, the sauce was of my desired consistency with the crabs being really fresh and meaty. Thank goodness, this time I hit the jackpot again. The sauce is sweet, spicy and eggy, not overly starchy. The crab is big, meaty and succulent. This is how chilli crabs should be! It wasn't too long ago that one had to drive all the way to the East Coast to feast on cooked to order market fresh seafood. Thankfully more seafood restaurants are setting up shop in the city area so having a seafood fix after work does not entail a long commute now. Big name seafood restaurants like No Signboard and Jumbo have been iperating our of the Esplanade Mall and Boat Quay/Clarke Quay respectively for several years now. The Superior Sharks Fin in Claypot Thai Style $50++ can be shared by up to two persons. 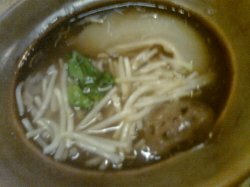 Dorsal fins are braised in a concentrated brown coloured seafood and chicken stock with bean sprouts and corriander leaves served in a side plate. The latter is added to the claypot at the table just before serving so diners can enjoy the QQ gelatinous fins and the crunchy sprouts along with the flavorful brioth. 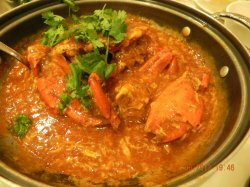 Chilli Crab is one of Jumbo's signature dishes. At $58++/kg it is not cheap but at least you won't risk being served an "underweight" crab at Jumbo. The Sri Lanka crab was as fresh as can be with firm succulent flesh and the chilli gravy was pleasantly spicy without being numbingly hot and viscously sticky. 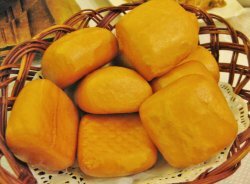 Perfect for dipping our deepfried mantou' buns into. 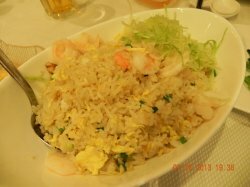 The fried rice was full of ' wok hei' but a little short of ingredients. 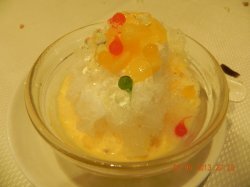 A nice gesture was the offer of complimentary dessert - soursop with shaved ice which was just what we needed to cleanse our palate after a hearty dinner. 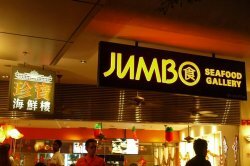 I generally like the food at Long Beach & Jumbo. for this evening out with a good friend, I ordered a 6-course set for 4pax. we had a good chat, most enjoyable dinner & pleasant evening. 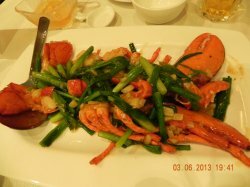 the menu said we start with a 姜葱 lobster with ginger & scallions – this was good standard as expected & I ate a lot of the scallions too. the steamed cod (top photo) was very good! 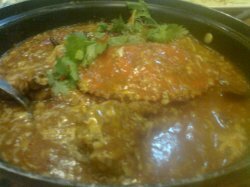 the chilli crab was decent in taste but for me it had no kick. all the foreign tourists in the crowded restaurant were dutifully ordering this and clearly relishing it, so it was good! anyway, my wife could not take too much chilli this evening so nothing lost. 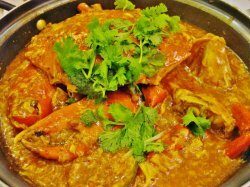 there were lots of foreign tourists trying out chilli crab so even the mild version was quite good though I liked it to be better.